DERMATOGLYPHICS – Introduction to the patterns in the skin ridges of the human hand! Dermatoglyphics – News, reports & research! The word ‘dermatoglyphics‘ was introduced in 1926 by Harold Cummins – the word refers directly to the study of the patterns & characteristics of the skin ridges in the human hand (and foot). What are the basic characteristics of the dermatoglyphics in the human hand? In most populations around the world is the ‘ulnar loop’ the most observed fingerprint pattern (see: the fingerprint of the pinky finger in the picture above). Loops are most frequently found on the little finger (and middle finger); loops are least frequently found on the pointer finger. In some Asian populations the ‘whorl’ (see: the fingerprint of the ring finger in the picture above) is more common than the ‘ulnar loop’. Whorls are more often seen on the thumb and ring finger. In population research usually the pointer finger demonstrates more variation than the the other fingers. For example the most common ‘ulnar loop’ is least often seen on the pointer finger, which often exhibits an other pattern such as: the ‘arch’, ‘tented arch’, ‘whorl’ or ‘radial loop’ (see: the pointer finger in the picture above). The variations in the dermatoglyphics of the handpalm are much more complex than the variations in the fingerprints. An important element concerns the presence of the ‘palmar triradii’ (see: a, b, c, d, and t in the picture above): normally each finger is featured with a palmar triradius – triradius t belongs to the thumb (the thumb mouse – a.k.a. as the ‘thenar’, or in palmistry: ‘mount of Venus’ could be recognized as the third phalange of the thumb). The function of the fingerprints & dermatoglyphics in the human hand! Picture: example of the most common patterns in the dermatoglypics of the palm and fingers. Palm reading & the ‘pinkie’: characteristics of the little finger relate to autism! A curved little finger is often seen in people who have autism or medical syndromes. 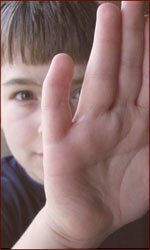 The presence of small physical defects – such as a curved little finger (the ‘pinky’ or ‘pinkie’) – and the occurrence of autism often go together. This is concluded by Ozgen – Dutch researcher at the UMC Utrecht, The Netherlands. The conclusion is the result of a meta-analysis of seven studies (published in the years: 1975-2005) in which the characteristics of 330 patients and 328 healthy controls are integrated. Ozgen became PhD on November 28, and July (2009) the results of her study are published in the journal ‘Molecular Psychiatry’. Ozgen reports that the most significant physical defects related to autism are: (1) a ‘curved’ pinky finger, (2) toes slightly too far apart, (3) deformed ear lobes, (4) a higher palate, and (5) eyes slightly further apart. In medical jargon the curved pinky (curved pinkie) is known as: clinodactlyly. Other common problems related to the pinky finger are: polydactyly (an extra pinky), camptodactyly (bent finger) & syndactyly (webbed fingers). How surprizing is this research result on the ‘curved’ little finger really? Maybe not so surprizing at all! For, in time a curved little finger has been related to up to over 60 medical syndromes, including: Klinefelter XXY syndrome, FAS: fetal alcohol syndrome (16% to 51%), and most common: Down syndrome (35% to 79%). However, one should also noticed here that the ‘curved’ little finger can be seen in the hands of healthy people as well. Statistics for normal & healthy people reported for the ‘curved’ little finger vary from: 1% to 19.5%. Never underestimate your little finger: the ‘pinkie’! The simian line: Down syndrome & asian populations! The simian line is often found in Down syndrome, but also frequently seen in Asian populations. The simian line is a ‘notorious’ hand crease and well-known for it’s significance in Down’s syndrome – more than half of these people have a simian line in 1 or both hands, while only about 1% of healthy populations have a simian line. Nevertheless, this line is also frequently observed in the hands of certain ethnic population – especially in Asians! In 1866, R.L. Down discovered in 1906 the relationship between the simian crease and Down’s syndrome. The simian line is also know as: the ‘simian crease’ or ‘single palmar transverse crease’. ‘Healthy hands’ with the simian line usually do not have the other stereotypical hand features related related to Down syndrome are missing (examples of other Down syndrome-related hand features are: a short thumb, curved little finger, certain dermatoglyphic patterns in the palm and fingerprints). In some (Asian) populations is extraordinary frequently seen, such as: Pygmies: 34.7 %; Gypsies: 14.3 %; Chinese: 13.0 %; Koreans: 11.2 % – more percentages are presented in the full article. Do you have a simian line?